Sir David Attenborough was given an Award of Doctor of Science honoris causa by City in 1972. 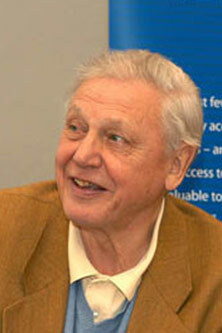 A broadcaster and naturalist, Sir David began working on natural life programmes in 1952. He was Controller of BBC2 and Director of BBC Television Programming for periods in the 1960s and 1970s. Amongst other industry awards, Sir David was given the BAFTA Academy Fellowship Award (lifetime achievement) in 1980. He holds honorary titles including a knighthood, CBE, CVE and OM. Sir David has also made programmes for Sky, and has stayed at the forefront of technological advances in television.